The data bank contains all catalog data since 2000/2001. Prototype: "Emma" locomotive as well as Jim Button, Lukas the locomotive engineer, and the small locomotive "Molly" from the movie "Jim Button and Luke the engin driver". 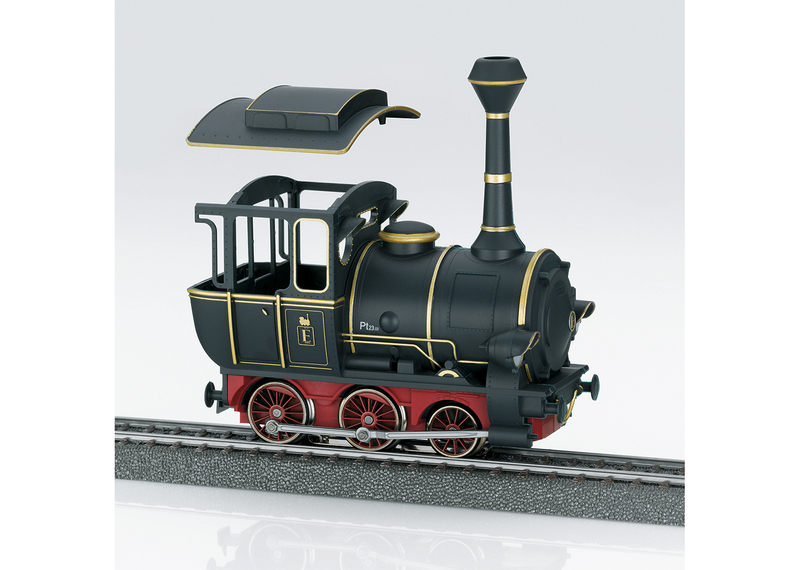 "Emma" locomotive includes a removable roof, and sound and light functions. 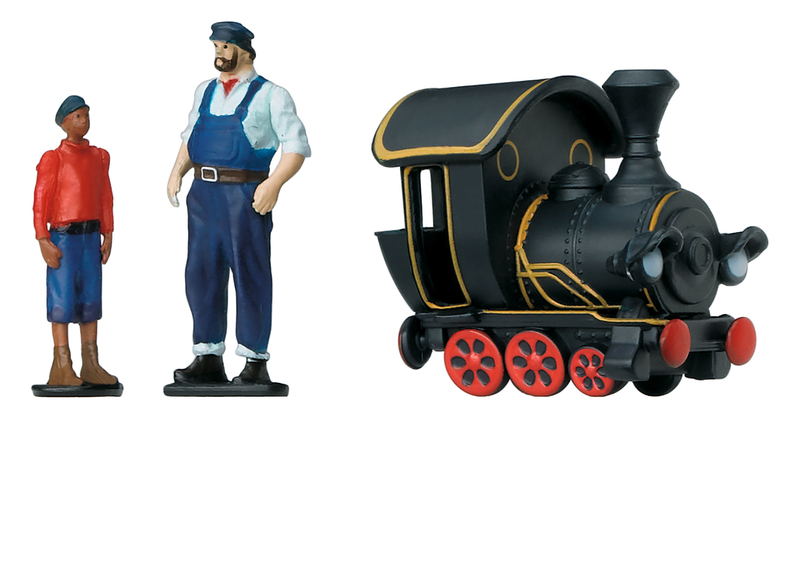 Toy figures of Jim Button and Lukas the locomotive engineer, which can be put in the "Emma" locomotive cab, as well as the small locomotive "Molly" provide great play fun and accompany you on your adventure. Digital infrared controller for control of up to 4 locomotives. Freedom of movement around the layout with the wireless infrared controller. Model: The "Emma" locomotive has an mfx digital decoder and two sound functions that vary with the speed. It also has dual headlights that will work in conventional operation and that can be controlled digitally. Warm white LEDs are used for the lighting. The locomotive frame and body are made of plastic. 1 axle powered. Traction tires. The locomotive has coupler hooks. 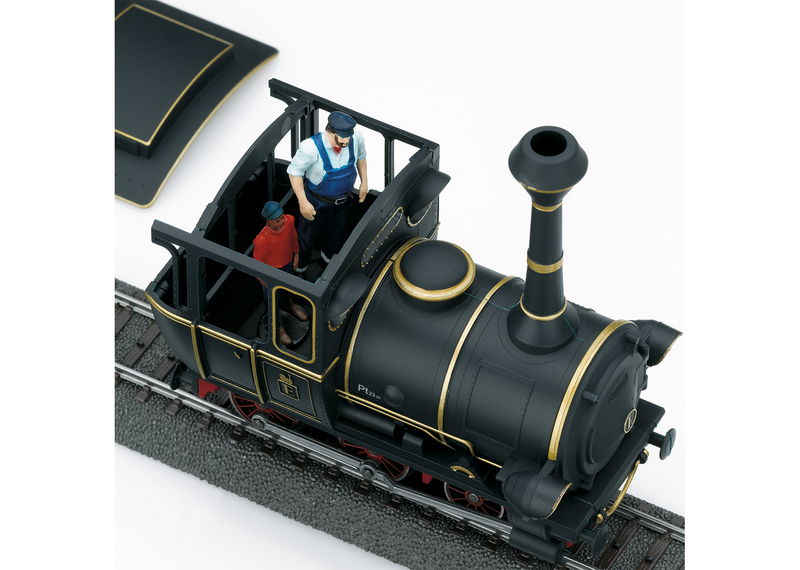 The "Emma" locomotive has a removable roof so that the toy figures Jim and Lukas can ride along in the locomotive cab. The "Emma" locomotive comes in an enlarged version (not 1? scale) for running on H0 C Track. 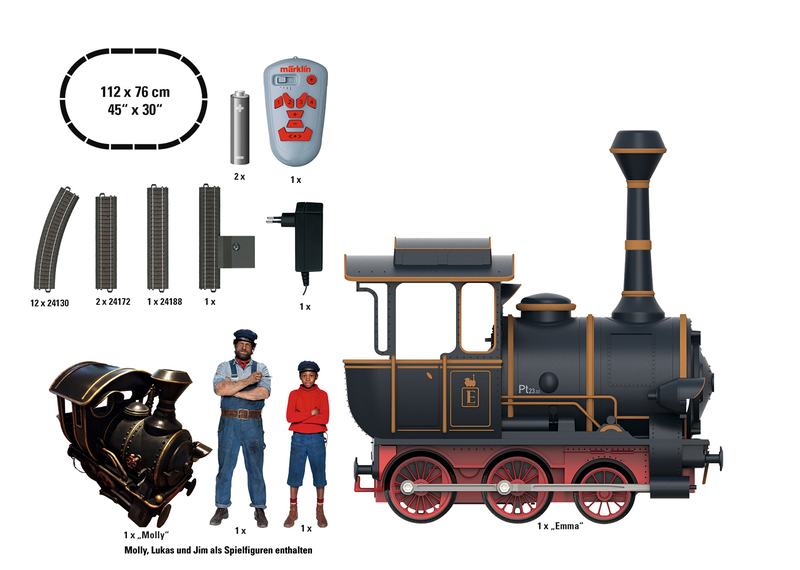 Jim, Lukas, and the small locomotive "Molly" are included as toy figures and provide great play value. The dimensions for the Emma locomotive are: Length over the buffers 100 mm / 3-15/16", width 60 mm / 2-3/8", and height 105 mm / 4-1/8". Toy figure Jim: height approximately 36 mm / 1-7/16". Toy figure Lukas: height approximately 45 mm / 1-3/4". 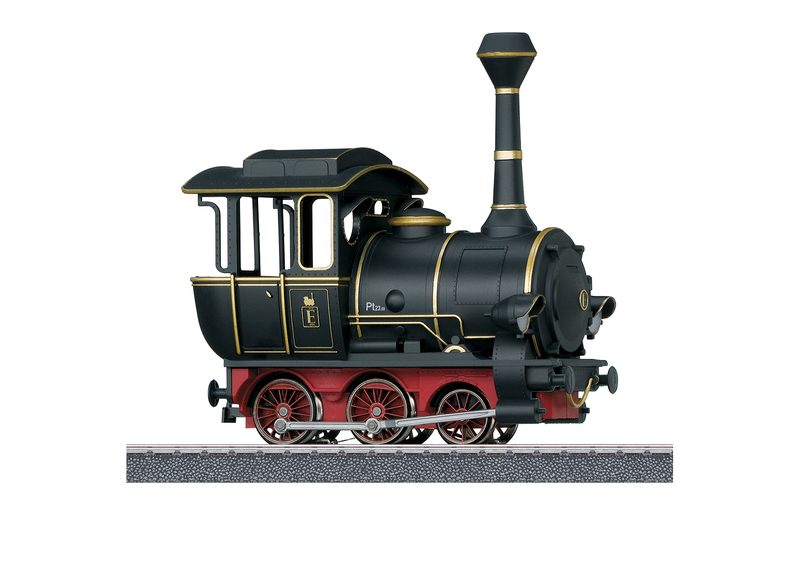 Molly locomotive: height approximately 42 mm / 1-5/8". Contents: 12 no. 24130 curved track, 2 no. 24172 straight track, 1 no. 24188 straight track, 1 base station, 1 switched mode power pack and a wireless infrared controller. 2 each AAA batteries are included with the set. This set can be expanded with the C Track extension set and with the entire C Track program. The trip begins ... dive into the theme "Jim Button and Luke the engin driver" and start your trip together with the "Emma" locomotive, Jim Button, and Lukas the locomotive engineer. 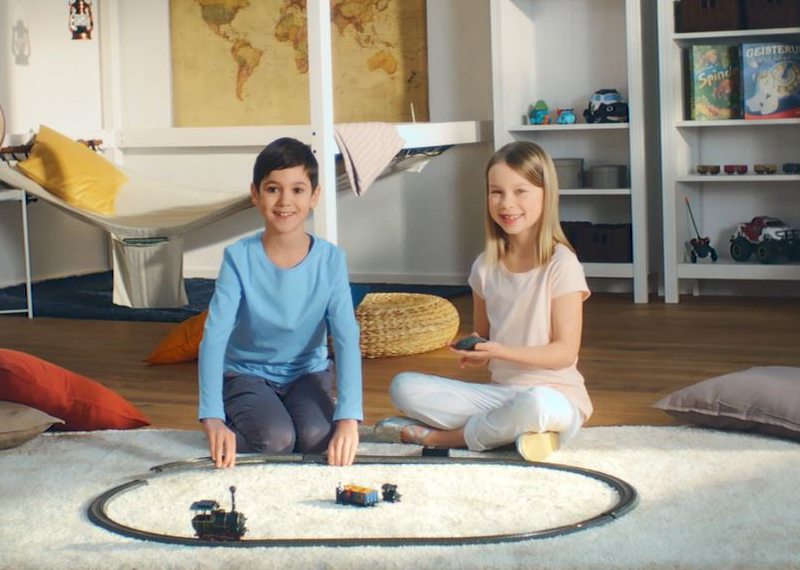 Experience the adventure and discover along with the other "Jim Button" products the world of the movie of the same name "Jim Button and Lukas the Locomotive Engineer". e Digital decoder with up to 32 digitally controlled functions. The quantity depends on the controller being used. h Built-in sound effects circuit. C Dual headlights at the front.